Several years ago, when tomato grafting was a relatively new technique, we did try out the grafting method in the demo garden. However, that turned out to be 2011, when it got hot so early and stayed hot for so long that pretty much no one had any tomatoes to speak of for the whole year. Needless to say, all we really learned was that the grafted plants were healthier. This year, because of our rotations, we needed to put the tomatoes in the shorter beds, beds 5 and 6. 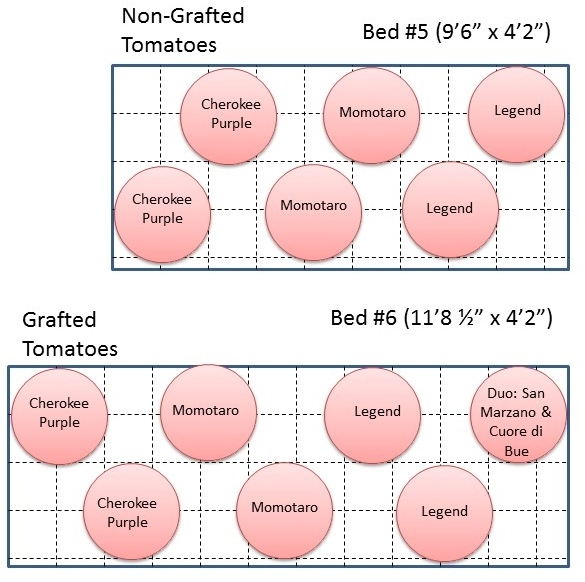 Since we have the two smaller beds, we thought it would be a good opportunity to try a comparison of Grafted vs Non-Grafted tomatoes again. What is tomato grafting? This is a process where the variety you want is grafted (fused) to a root system of a variety that has other characteristics you may want, such as disease resistance. This is one way to be able to grow heirloom tomatoes without the necessity of lots of rotation. Grafting has also been shown to increase the vigor and yield potential of most varieties. ‘Cherokee Purple’ is probably one of the most common and popular heirloom varieties. It is a purple skinned and fleshed variety with excellent flavor and decent yield. ‘Momotaro’ is a Japanese variety with dark pink skin and flesh. It is a hybrid slicer variety that has a reputation for excellent flavor. ‘Legend’ is a determinate red slicer that has late blight resistance. Not that we ever have an issue with late blight. It is also early producing and is also reputed to have great flavor. ‘San Marzano’ and ‘Cuore di Bue’ are both heirloom paste tomatoes. The ‘San Marzano’ is a more traditional Roma and the ‘Cuore di Bue’ is a no heart type.